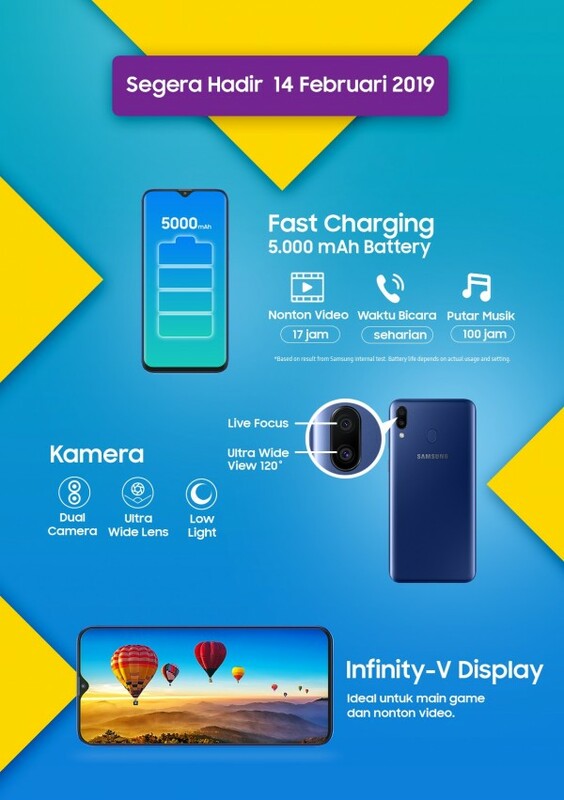 Today, we received a couple of tips regarding retailers in Indonesia and their plans to sell the Samsung Galaxy M20 with a huge 5,000 mAh battery. JD Indonesia has the following poster up on a landing page with the February 14 date when the Galaxy M series will be available for sale. Lazada Indonesia also has a landing page for the Galaxy M20. JD’s page has a live countdown timer leading up to the day the phone becomes available. Both landing pages tout the phone’s huge battery, Infinity-V display, and its dual cameras. The Samsung Galaxy M lineup is Samsung’s newest mid-range tier which first launched in India in late-January. The Galaxy M20 has a 6.3-inch IPS LCD screen with a waterdrop notch and an 8MP selfie camera. On the rear is a rear-mounted fingerprint scanner next to a 13MP + 5MP Wide dual camera setup. Powering the M20 is an Exynos 7904 with either 3GB or 4GB of RAM and 64GB of internal storage. Out of the box, the phone supports 15W fast-charging, has a headphone jack, dual-SIM slots with a dedicated microSD card slot, and the phone runs Android 8.1 Oreo with Samsung Experience 9.5. The device should receive Android Pie much later this year. The 4GB Galaxy M20 costs INR 13,000 (~$181) so you can get a general idea of how the phone might be priced for this market. Samsung’s new mid-range lineup has plenty of value for its price, which is appealing to many folks, particularly those in emerging markets – is the M20 something you’re interested in? It is. Rp 2,799k for the 3/3GB model. That's roughly $198. Nah redmi note 7 is a lot better option.